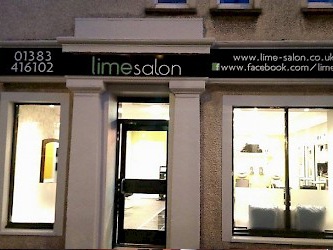 Lime Salon was launched in 2010 by salon owner John Baillie. John’s ambition was to create a progressive, professional salon with highly skilled staff keen to learn, advance and pass on their skills. While keeping the standards high, he wanted to keep the atmosphere relaxed and friendly. In 2016, John and manager Ryan opened our large salon in the previously unloved old Corn Exchange building in Inverkeithing. This large space was developed into the stunning salon it is today, and the salon is now home to a team of over 30 staff. 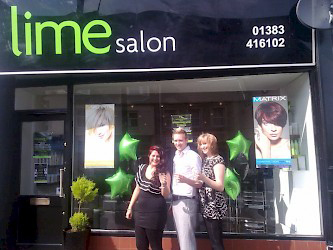 International hair colour brand Matrix supported John and the team from the day Lime opened in 2010. When the new salon opened, the team were honoured by Matrix making us their flagship salon for Scotland. This secured a special relationship between Lime Salon and Matrix that’s still strong now. 2017 saw more developments as Lime stepped into Dunfermline, with the opening of the Bridge Street Salon. This former menswear store was transformed into a beautiful bright salon, complete with a Beauty Suite in the basement. The well-known and award-winning salon Couper and Co was also taken over by Lime, bringing a whole team of talented hairdressers into the Lime family. Couper and Co offer experts in precision cutting, as well as creative colouring and beauty treatments. As we as offering hair services, we are now proud to have a large team of Beauty Therapists and Nail Technicians that’s bring a variety of services depending on the salon. All our salons offer nail brow and lash services, Dunfermline and Falkirk offer spray tan and body wax, and Dunfermline has a dedicated Decleor treatment room.